During the Vietnam War, hundreds of American prisoners of war faced years of brutal conditions and horrific torture at the hands of communist interrogators who ruthlessly plied them for military intelligence and propaganda. 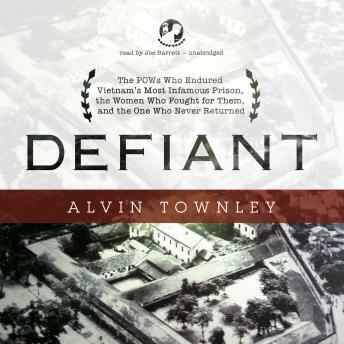 Determined to maintain their code of conduct, the inmates of the Hanoi Hilton and other POW camps developed a powerful underground resistance. To quash it, the North Vietnamese singled out its eleven leaders, Vietnam’s own “dirty dozen,” and banished them to an isolated jail that would become known as Alcatraz. None would leave its solitary cells and interrogation rooms unscathed; one would never leave. As these men suffered in Hanoi, their wives launched an extraordinary campaign that would ultimately spark the POW/MIA movement. When the survivors finally returned, one would receive the Medal of Honor, another became a US Senator, and a third still serves in Congress. A story of survival and triumph in the vein of Unbroken and Band of Brothers, Defiant will inspire anyone wondering how courage, faith, and brotherhood can endure even in the darkest of situations.